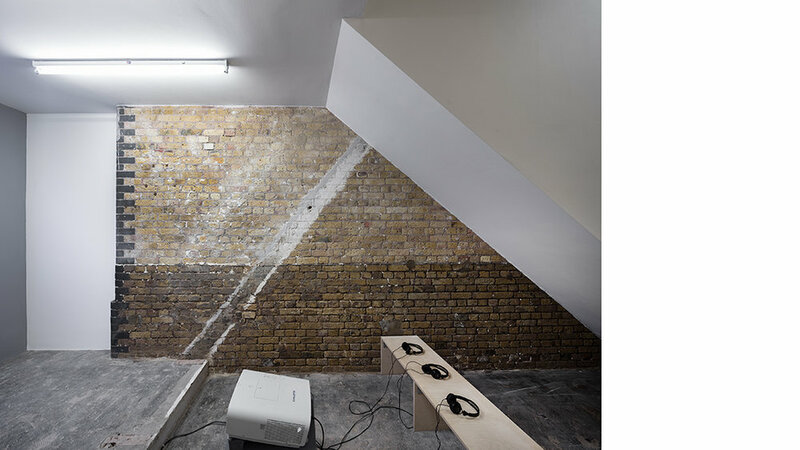 New exhibition spaces for the contemporary art gallery Hollybush Gardens, are formed beneath the Rosebery Avenue Bridge Viaduct, in an abandoned six-meter high brick vault. Through careful examination of the existing building fabric, the project proposes a series of highly specific spaces for art which respond to the strongly architectural, almost archaeological, nature of the existing space. The main entrance is from an adjacent industrial mews Warner Yard and opens to a long gallery formed of London stock engineering bricks, sand-blasted to expose their soft-yellow colour in contrast to the deep blue glazed corner bricks. Beyond is the main gallery—a six-meter high vaulted space following the profile of the viaduct arch. A new lighting and services grid is suspended from an existing gantry system, while the existing concrete floor is cleaned and left exposed. A new opening allows for lateral circulation to a small pocket-gallery located beneath a new stair. This connects to upper-level offices, a balcony and small studio. Program: Galleries and musuems; Client: Hollybush Gardens; Location: London, UK; Status: Completed 2013; Photography: Maris Mezulis. 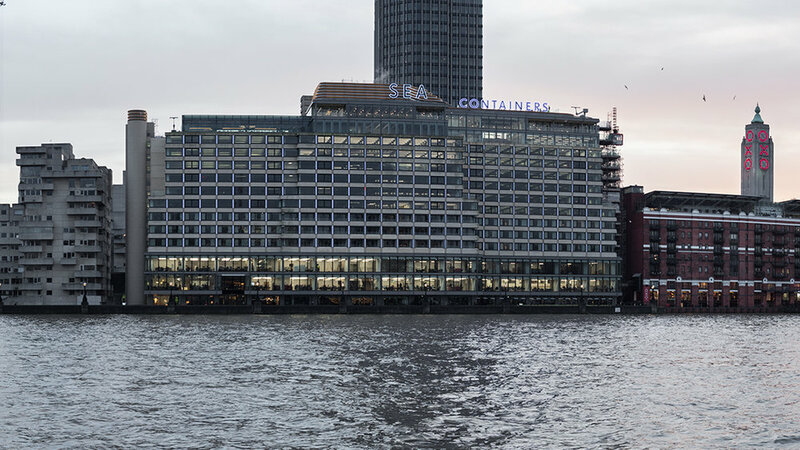 Sea Containers was designed in 1974 as a waterfront hotel to promote British tourism, but converted to office use upon completion. 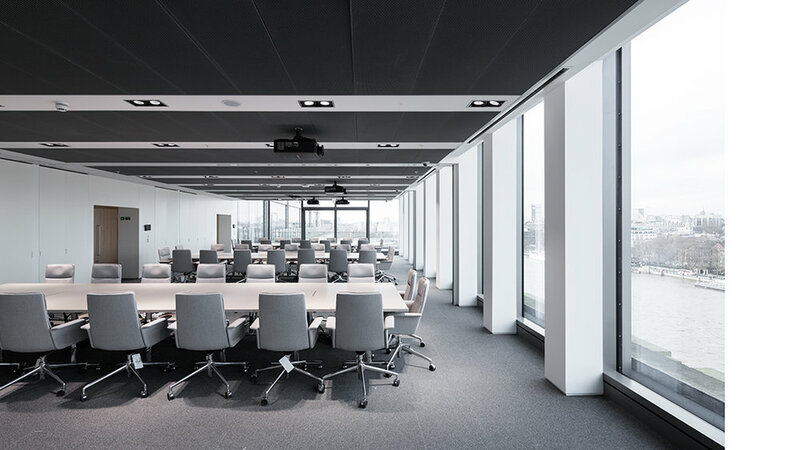 In 2013 the studio won an invited competition in conjunction with workplace specialists BDG to create 20,000 sqm of workspace for a group of ten media companies, which previously were located across a number of sites throughout London. By locating working space in the lower parts of the building, the upper two floors are liberated for shared staff and hospitality uses, including a 200-person amphitheatre, café, bistro, private dining and a new roof terrace. 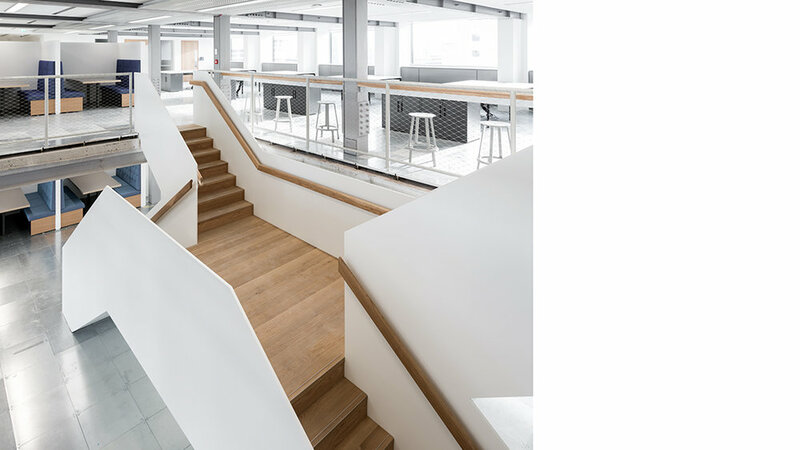 These spaces double as work settings – from small and intimate to large and noisy – and together to define a shared architectural identity for the group companies. Many buildings along the Thames Path have become important London landmarks. The Royal Festival Hall, National Theatre, Tate Modern, Oxo Tower and Shakespeare’s Globe are all established cultural points. At an urban scale, the ambition with Sea Container’s is to make shared and common activities visible from the river, drawing it back into the cultural, creative and commercial life of the Thames. Program: Commercial; Client: Ogilvy Group/WPP; Location: Southbank, London; Status: Invited competition, first prize 2013; completed 2016; Partner architect: BDG Architecture & Design; Photography: Maris Mezulis. 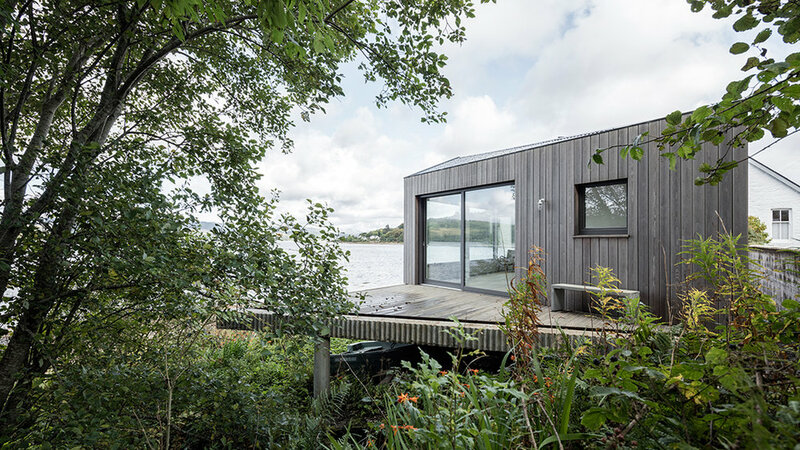 The Boat House is an artist studio which occupies the last available plot on the edge of Loch Fyne in the Argyll and Bute region of Scotland. It lies at the inflection point of a series of hills forming Brackley Wood to the North and enjoys views up-and-down and directly across the Loch. The project replaces a dilapidated structure from the 1950’s. Its volume responds to a number of different considerations, such as orientation towards views, privacy, prevailing winds and the angle of summer and winter sun. 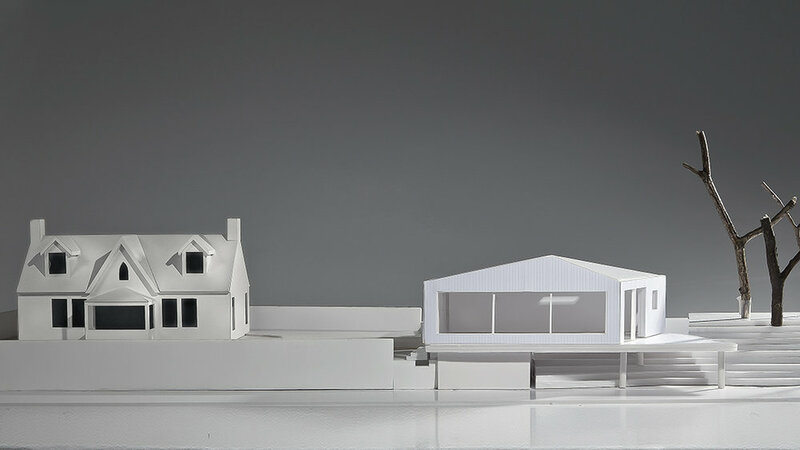 The new studio is imagined as a large, subtly inflected room which sits over a concrete platform. The concrete platform extends to form a private outdoor space extending to the beach and springs from an existing stone retaining wall. It is clad with larch, drawing on the scale and material palette of nearby agricultural structures which line the waters edge. Client: Withheld; Location: Strachur, Scotland; Status: Completed 2017; Photography: Maris Mezulis. Dalston is an area of London characterised by two-and-three storey brick structures originally built to accommodate light manufacturing. Following the demise of industrial activity towards the end of the 20th century, these structures were abandoned and subsequently taken over by artists for studio space. In recent times, rising land costs have seen many of these artists forced to leave and the original buildings razed to make way for residential redevelopment. This project both continues and subverts this cycle of urban development. The original artists who occupied the site for the last ten years, have elected to redevelop their existing building in order to create three new apartments over three floors. Access is arranged around a common stair adjacent to a small light court that provides daylight to the rear of the site. The apartments share common cores and service risers, but individual layouts vary according to the needs of each owner. The facade of the original one-storey structure is mirrored vertically. This defines the overall volume of the new building, creating the appearance of a two-storey structure while continuing the scale of the original streetscape. 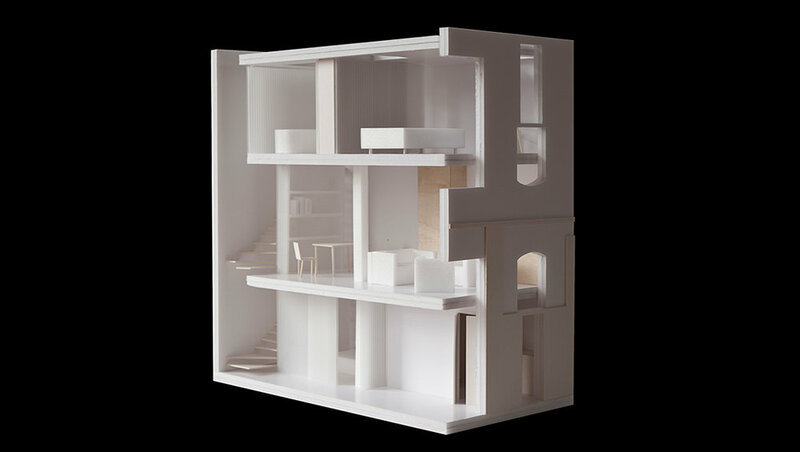 The variations between the three new floor levels, and the facade’s two-storey configuration of windowsills and heads creates surprising relationships between the inside and outside – almost in the manner of a ruin – while screening the interior from the street. Program: Residential; Client: Withheld; Location: London, United Kingdom; Status: Completed 2015; Photography: Maris Mezulis. The history of Belsham Street, a Victorian terrace of light-industrial workshops, dates back to the 19th century. The location has experienced a variety of uses and patterns of development, resulting in a complex and incoherent urban setting. 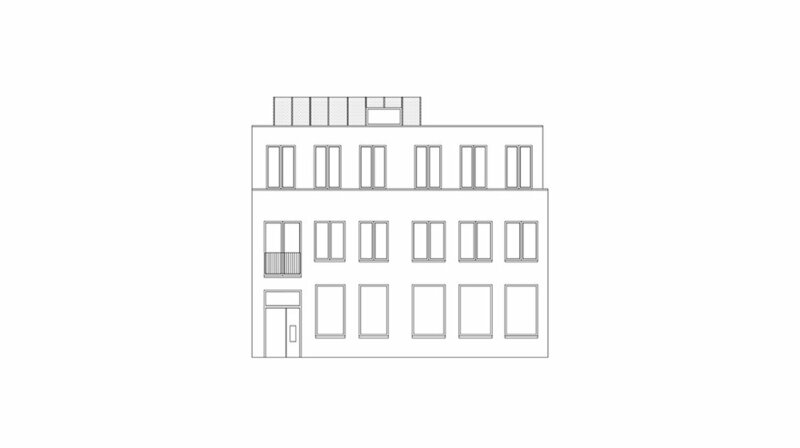 The project involves the redevelopment of an existing commercial building within this milieu, including with the addition of a new rooftop level. The resulting structure has something of the character of a Renaissance palazzo – that sophisticated conflation of workshop, office, tavern, warehouse and house that collapses the boundaries of family life by extending accommodation to workers, apprentices, friends, extended family and business associates. Studios for an artist and furniture designer occupy the ground floor. These contain offices, production areas and an acoustically separated workshop. One four-bedroom duplex and three two-bedroom apartments are arranged over the two floors above around a central stair. Careful dialogue with planners has enabled a fully green rooftop and enclosed garden directly accessed from the main stair. Three half-sunken rooms, like allotment sheds, provide additional accommodation. 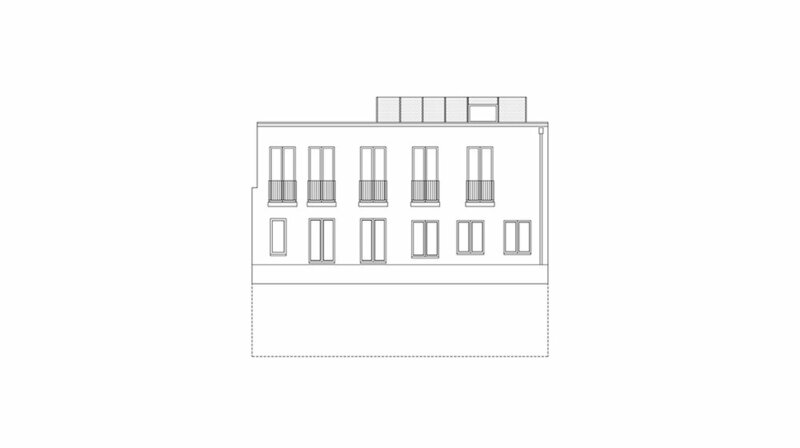 The rooftop becomes a semi-private common space for the building’s occupants. 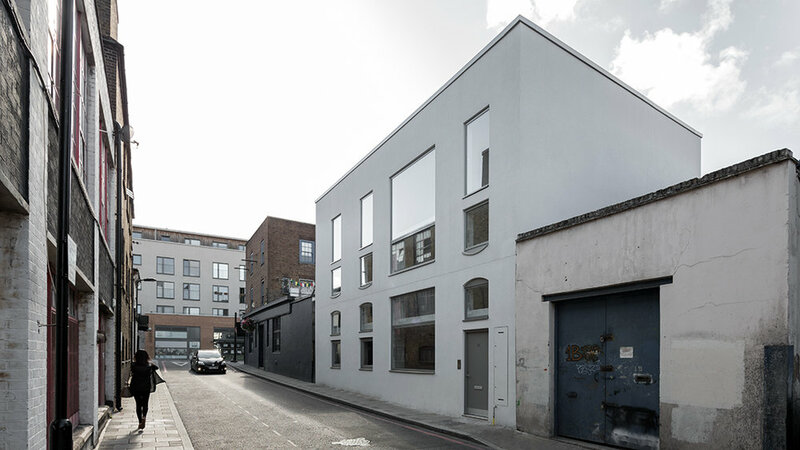 Program: Residential, artist studios; Client: Withheld; Location: London, United Kingdom; Status: Completion 2016; Photography: Maris Mezulis.